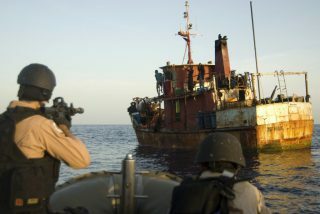 Pirates armed with M16 rifles boarded the fishing trawler F/B Sri Dewi 1 while the vessel was underway off eastern Sabah, Malaysia, and abducted two Indonesian crew members on September 11, 2018. The perpetrators then headed towards Sitangkai, Tawi-Tawi in a motorboat with the two abducted seafarers, identified as the boat master and assistant boat master. The incident was reported by the crew members of the sister vessel F/B Dwi Jaya to Eastern Security Command (ESSCOM) in Malaysia. “Upon receipt of the information, the PCG District Southwestern Mindanao (CGDSWM) immediately dispatched PCG vessel MRRV 4408 to augment with CG Station Tawi-Tawi and Joint Task Force Tawi-Tawi in its pursuit operations against the perpetrators. Likewise, the law enforcement authorities in Zamboanga, Basilan, Sulu and Tawi-Tawi intensified its monitoring and networking to establish the location and status of the kidnap victims,” Asian piracy watchdog ReCAAP ISC said. Fishing boats Sri Dewi 1 and Dwi Jaya 1 were manned by 15 crew/fishermen and had been on fishing venture in the seawaters of Pulau Gaya, Sabah for three days. At the time of the incident, there were only four crew left on board the two fishing boats while the other 11 crew went to mainland. According to ReCAAP ISC, this is the first crew abduction reported in 2018 in waters in Sulu-Celebes Seas. The last actual incident reported to ReCAAP ISC occurred on board Super Shuttle Tug 1 on 23 Mar 17, and the last attempted incident occurred on board Kudos 1 on 16 Feb 18. “As the threat of abduction of crew in the Sulu-Celebes Seas and off eastern Sabah still remains, ReCAAP ISC maintains its advisory issued via the ReCAAP ISC Incident Alert dated 21 November 2016 to all ships to reroute from the area, where possible. “Otherwise, ship masters and crew are strongly urged to exercise extra vigilance while transiting the Sulu-Celebes Seas and eastern Sabah region, and report immediately to the Centres as shown in map below,” ReCAAP said. The incident is being reported as three abducted fishermen were released after spending over a year in captivity. The three Indonesian crew of Malaysian fishing banca were abducted by nine armed perpetrators in January 2017, woff Bakungan Island, Taganak, Tawi-tawi. The terms of their release were not disclosed.